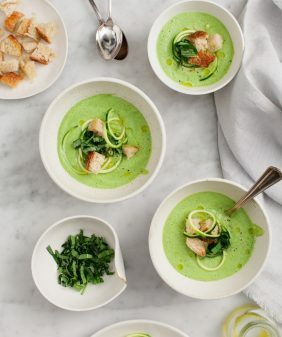 Herbs & leeks make a bright, zippy chilled soup for hot summer days. This easy vegan soup is filled with protein from garbanzos and a lemon yogurt sauce. So I make no apologies… it’s one of my favorite things, especially when my basil plant is flourishing like it is. This is my attempt at contributing to The Food Matters project today. It’s white bean and asparagus soup day. However, it’s been in the 90’s here, so I just couldn’t bring myself to making a hot & creamy rosemary-ey soup. 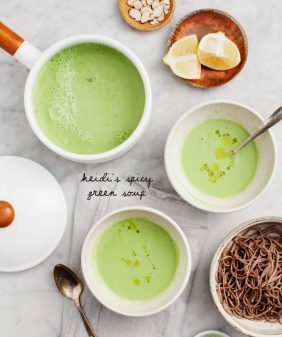 A chilled, bright, herb-packed soup was what was called to me instead… but check out what interpretations the others have made here. Make the soup: In a medium to large saucepan over medium heat, heat the oil and add the leeks, shallots, and garlic, and a few pinches of salt. Sauté until translucent, 3-4 minutes. Add a splash of white wine or water and scrape any bits that are starting to stick to the bottom of the pan. Let wine cook down for 30 seconds to a minute. Add the frozen garbanzo beans and vegetable broth. Let simmer for 5 or so minutes until the garbanzos are thawed and tender. Add another few pinches of salt. Remove from the heat and let cool to room temperature. It’s important to add the herbs when cooled; you don’t want to cook them in this soup. They’ll be more vibrant here if they’re pureed in their raw form. In a blender, puree the cooled soup mixture. 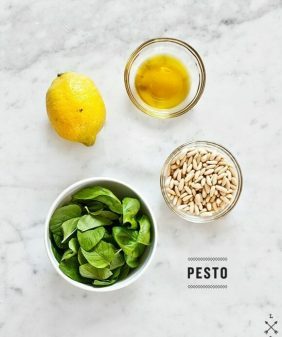 Add the almond milk, lemon juice, grated nutmeg, parsley, basil, and honey and pulse until the herbs are well chopped, but some flecks of green are still visible. Taste and adjust seasonings to your preference (salt, pepper if it’s too bland, sugar if it’s too tangy, a splash of vinegar or more lemon if it’s too earthy, more olive oil if it’s not rich and silky enough). Chill the soup in the fridge for 30 minutes or up to a day. Remove from the fridge and stir in a bit of water if soup is too thick. Taste again and make adjustments. I added another squeeze of lemon and drizzled in some walnut oil. 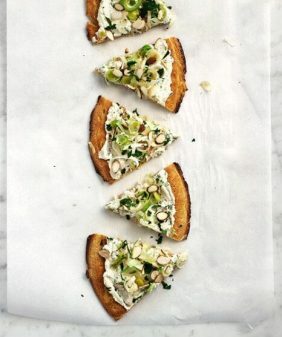 Serve with a garnish of chopped herbs, a drizzle of walnut oil, and a dollop of yogurt sauce, if using. Make the yogurt sauce: Stir together the yogurt, agave, olive oil, lemon juice, and a pinch of salt. Adjust seasonings to taste. Nothing wrong with celebrating basil. One of my favorite favorite herbs, smells and flavors! : ) Every time I get a whiff, it feels like summer in Chicago. 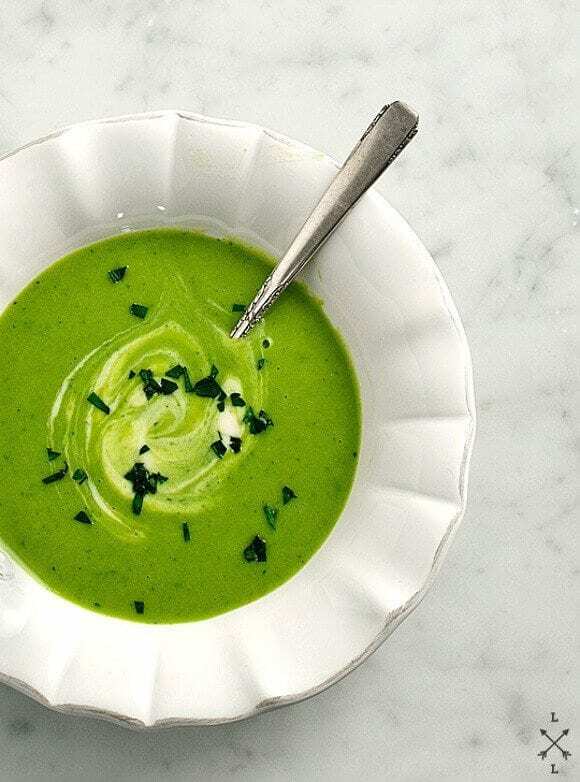 And this soup is such a gorgeous green—I love that! where do you find green garbanzos? could you substitute regular garbanzo beans or edamame? They have them at my whole foods – but I was actually looking for fava beans to make this with. So I would try favas or regular garbanzos (or even peas). I don’t know why I feel like edamame might be a little weird in this. I am not exaggerating, but I’m seriously swooning over how gorgeous your soup is… I’ve never heard of green garbanzo beans and now I am so curious to try it. I also love your yogurt sauce… yogurt has saved me tons of times. Sometimes when I make chilis too spice, I just add Greek yogurt and it is 100x better than sour cream. Love your take on this recipe and love the beauty of your soup! Have any tips for a healthy basil plant? My plant is struggling a bit. The color of your soup is fantastic! I wish I had a bowl of that right now! This sounds absolutely delicious. Awesome idea! I love the color! 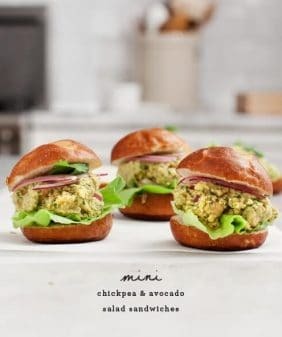 So radiant and this looks delicious! As the weather is getting warmer, it’s hard to eat warm soup. That green soup is incredibly vibrant. Gorgeous! I was sweating at the thought of making hot soup this weekend, but I would have been happy eating this soup. I’m so pleased to see this post: I bought a bag of frozen green garbanzos and haven’t figured out what to do with them yet. I love garbanzos and make the regular ones all the time, I even love the smaller black ones too so green must be added to my repertoire. How funny that this was your take on the FMP soup–I made it last night (and just had some more for lunch a few hours ago). We can still only dream of basil at this point, though now that it’s May it’s not much longer. I love that green color too. Huh, basil brownies. Worth trying! With raspberries, me thinks. What beautiful color! This soup looks delicious, and I love your photography. What a truly beautiful soup!!! Love the vibrant shade of green. 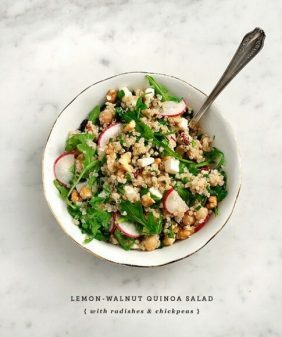 Looks incredibly healthy and delicious. I adore basil too and add it to anything & everything. I’m hoping to grow some basil this spring/summer in the garden. I go through a lot and it would nice to always have some on hand. Basil brownies? that sounds awesome! Love the combo of basil and strawberries. Are the green garbanzos a variety of garbanzos or are they young reg. garbanzos? Can I just say that it makes me so happy how many of your recipes call for a splash of wine? Healthy, clean food and a reason to pour a little glass while I cook. You are brilliant!